For top quality accommodations close to the Coast Guard base, Holly Shores is the perfect place to call your home away from home. 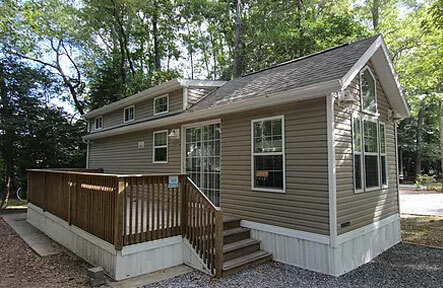 Choose from a variety of cozy cabins, cottages and RV campsites. for you or your family visiting Cape May and Wildwood, NJ. Our Coast Guard camping specials offer an affordable way to enjoy the Cape May area in luxury comfort. 10% off Cabin or RV Campsite rates for 4 adults. Golf Carts, Kayaks & Bicycles available for rent. Book one of our Deluxe Cabin rentals and experience our spacious accommodations for yourself. 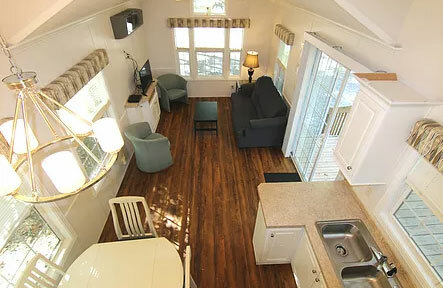 All deluxe cabins feature a full kitchenette with dishes and utensils, refrigerator, microwave, coffee maker, air conditioning/heating, and a flat screen TV with VCR and DVD. Outside, you will find a fire ring, picnic table and raised charcoal grill, perfect for family get togethers and picnics. Our RV Campsites include WiFi, 20/30/50 amp electric service, water, sewer and cable TV. Sites can accommodate RVs up to 40 feet long and also include a fire ring and picnic table. The Holly Shores 38-acre wooded resort is conveniently located only 4 miles from the beautiful beaches of Cape May as well as the Coast Guard base. We have bikes, kayaks, golf carts and sports equipment available to rent so you can enjoy the great outdoors to their fullest. *Restrictions may apply July and August.